The Back now gets jointed and glued up then thicknessed and the sides get thicknessed ready for the next step bending..
Once the top is at the correct thickness it too is cut to rough shape..
top, bottom & sides waiting to go together. Next step is to thickness the top and then cut out the soundhole, the soundhole is also bound in BW Purfling.. Turned out pretty good..
After that the top gets cut to rough size.. I was trying to decide if i would leave the rosette without any purfling or perhaps ad some BW purfling.. in the end i decided to use fine lined 1/32" BWB purfling which I think worked out well. 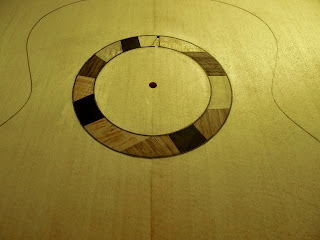 Next is planing the soundboard down to thickness.. 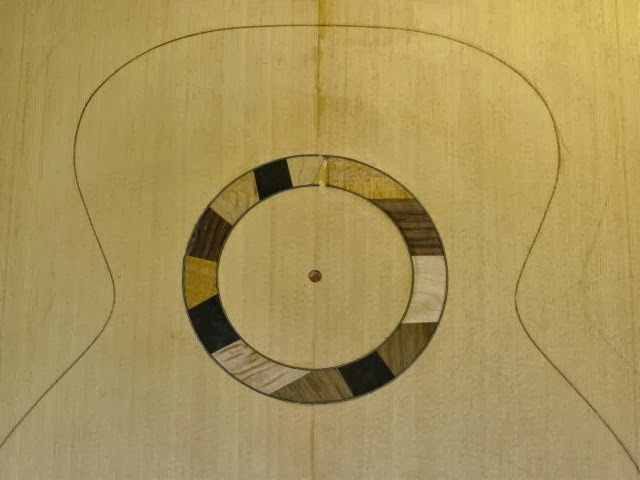 So Summer jobs are done and it is time to get started on building this Mandocello.. My order of building is sort of whatever I feel like doing that day.. So lets start with the top.. So all glued up and then cut to shape using a Dremel tool in a Bishop Cochran base, which works very well for this..
Now to route the matching pocket in the soundboard..